‘Today, 40 individuals had their heads cut off, including 16 Carmelite nuns from Compiègne.’ This fragment, dated 17 July 1794, from the diary of 69-year-old Célestin Guittard de Floriban (who took a particular interest in the public guillotinings) serves to remind us that Dialogues des Carmélites had at its centre a real event. Initially, the French Revolution of 1789 was not intrinsically opposed to religion; but it was, from the start, unrelentingly harsh towards contemplative religious orders like the Carmelites. Writers in the Enlightenment had regarded such figures with something like contempt. ‘They eat, they pray, they digest’, was Voltaire’s summary. The wealth of their communities seemed a reproach when set against apostolic poverty. Indeed, religious houses formed a system of outdoor relief for supernumerary children of the upper classes. In these anti-clerical polemics, nuns were invariably held to be victims. It was widely believed that most had been forced to take lifetime vows as minors and under pressure from their families. The nun’s veil was thus an iconic symbol of oppression. Where they were not (in a surprisingly widespread fantasy) believed to be degraded brothels where sisters held orgies with confessors and fellow nuns, convents were viewed as mini-Bastilles where defenceless girls were pitilessly incarcerated and abused mentally and physically. In 1792–3, the French monarchy was overthrown, a republic founded and France drifted into war against most of Europe. The National Assembly reacted to the threat of state failure by adopting a policy of Terror. A deep abyss opened up beneath those who resisted the call of Revolutionary patriotism. The Carmelites of Compiègne were of this number. In 1792, the Carmelite convent was taken over by Compiègne’s municipality and the sisters were dispersed around private homes in the town. In June 1794, Compiègne’s Revolutionary Surveillance Committee concluded that the sisters were holding ‘gatherings and conventicles’ with counter-Revolutionary intent. Packed off to Paris to face trial, the sisters arrived in the city at 11pm on 13 July 1794 and were consigned to the gloomy Conciergerie prison on the Ile de la Cité. Four days later they were charged by the Revolutionary Tribunal. Founded in spring 1793 to try counter-Revolutionary offences, the court’s activities had by mid-1794 speeded up and become increasingly perfunctory. The Carmelite affair proved to be a ‘batch trial’: the sisters shared the dock with a sundry crowd that ranged from noblemen through to a cobbler and a hairdresser. Conviction was a formality. To prepare prisoners for the scaffold, their headgear was removed in the Conciergerie prison, the clothing at the back of their necks ripped open and their hair cut so as to bare the nape of their necks in preparation for the guillotine. After a cup of chocolate each (procured by their Superior who bartered her fur stole with other prisoners), the 16 sisters were crammed into two of the five tumbrils which set out from the Ile de la Cité after 6pm. It took well over an hour to reach the open space on the south-eastern edge of the city (now Place de la Nation) where the guillotine was at this time erected. From the gates of the Conciergerie to the guillotine itself, the nuns sang religious canticles. At around 8pm, the public executioner allowed them to conduct final prayers at the foot of the scaffold, and their Superior was granted her wish to die last. 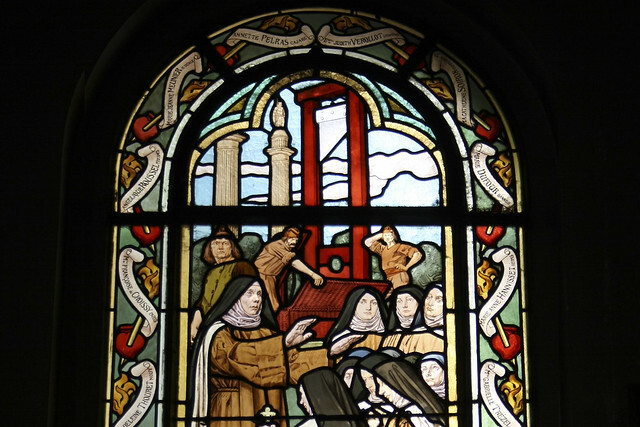 Throughout the execution of the 16 women, which would have lasted half an hour or more, the sisters went sequentially to their deaths singing the 'Laudate Dominum', a hymn particularly associated with their founder, Teresa of Ávila. Eventually, only the voice of the Superior was to be heard. And then the singing stopped, and there was silence. The bodies of the Compiègne Carmelites were thrown pell-mell into the collective pits used for guillotine victims in the grounds of the Picpus cemetery. Their remains lie alongside those of around 1,300 others executed in Paris during the Terror. This is an extract from Colin Jones's article, which you can find in full in the programme book for Dialogues des Carmélites. This is available in the theatre at performance times and from the ROH Shop. The production, originally from De Nederlandse Opera, Amsterdam, is given with generous philanthropic support from Mrs Aline Foriel-Destezet, The Taylor Family Foundation and The Calouste Gulbenkian Foundation. Stunning faith. Where is it today especially in England and France, Canada and the US? The story of these innocent women will be retold where opera lovers gather or listen privately to Francis Poulenc's great musical homage. Our century faces its own cult of death in the so-called Islamic State. Saints in the making. They died for Christ. France's shame. This secular world can learn from them. Blessed are they who give their life for Christ. Pray for me. Their canonisation can not come quick enough, as far as I am concerned. They are one of my favorite Carmelite saints. Don’t understand why they have not been canonized by the Church. They died as Martyrs of the faith. The Institute of Carmelite Studies published a book called “To Quell the Terror” about these martyrs. The dignity and courage of the Carmelite Martyrs in the face of deliberate terror moves me deeply, and Poulenc's musical depiction of their executions is perfect.